THE MsFits present their Edinburgh Fringe award winning show I Spy Mrs Peery in the Newcastle Centre on Saturday 10 August at 8pm. Written by multi-award winning, BAFTA nominated playwright Rona Munro and presented by award winning comedy actress Fiona Knowles, I Spy Mrs Peery is a story of mystery, intrigue and suspense. 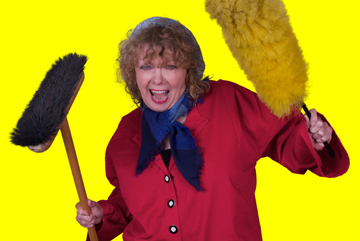 Much acclaimed comedy ‘I Spy Mrs Peery’ is coming to Newcastle on 10 August. More violent than a crash diet, more spine chilling than ice cubes down the back of yer nightie. Mrs Peery sees it all from behind her net curtains, she never crosses her own door step but she’s plenty to say about the state of her neighbours. What would she do if the big bad world got in through her nets? A though provoking slice of life focussing on three female neighbours. I Spy Mrs Peery is a hilarious yet at times extremely moving show from The MsFits Theatre Company who have 26 years’ experience touring, 20 of those years with one woman shows. The Scotsman hailed the play as “A triumph…plenty of laughs”. Tickets are available from the Visitor Information Centre, Newcastle Promenade or from Down Arts Centre Box Office by telephoning 028 4461 0747.